Every now and then I get a request to do some touch up work on a model. Sometimes it's a model I painted, sometimes it's a model someone else painted. This is one of those cases. With all of the commission work I do, models begin to show their wear after extensive use. In the case where someone decides they would like for me to fix chips and such, they simply send the model back to me and I do the repairs for them. In this case, I had a friend who had a unit painted by someone else and after some gaming with them, he decided that he wanted the iconography moved over on their shoulderpads and some minor chips repaired. No problem. When it's a model that I've painted, I just have to go back and look at the color scheme and the paints I used. When someone else has painted it, it get's a bit trickier. 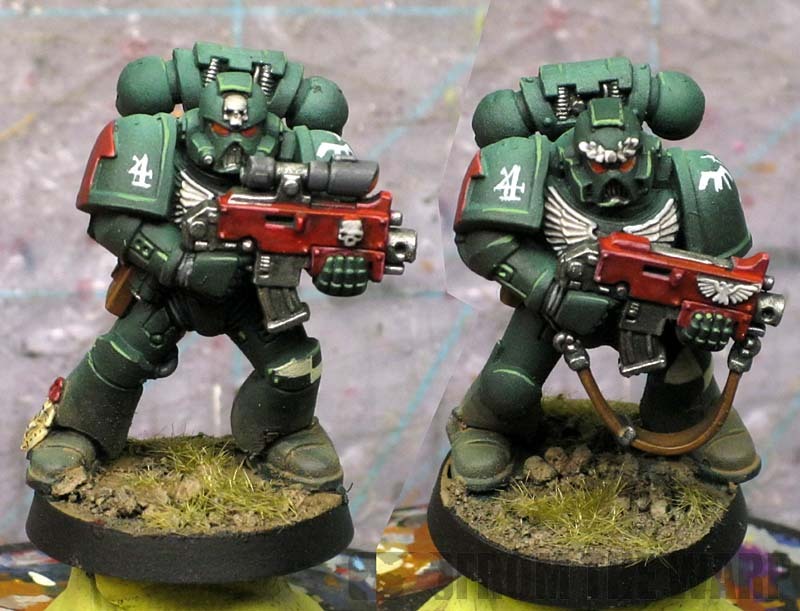 In this case, I had to match the green on the shoulderpad to repair some chips around the lower edge. It took a mix of four colors to get close enough that you don't notice the repair work. The red was easier to do only requiring two reds and a pair of washes to get it to blend in. The new iconography was done with thinned white in the new location to match the rest of the squad. All in all, you'd never notice the change unless it was pointed out, so I'm considering this one a win. If people miss the alteration all together, then my repair work was a success. Great work Ron, as usual. Thanks. I did not know that about the vertical arrow. I didn't think about it since I was just asked to change the location of the numbers. Yikes!